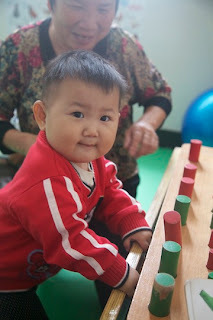 Lots of the children who belong to the orphanage live in foster homes in the surrounding area. 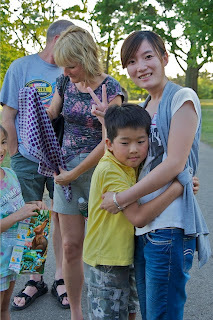 There are several clusters of families in the same neighborhood. 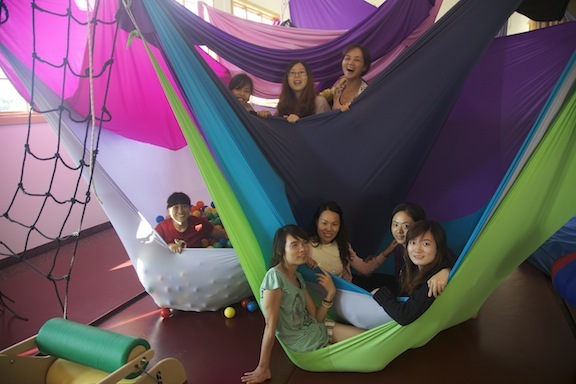 Last year, Dongnan Li set up 3 different therapy centers where the families can come daily to meet, talk and help their children. Red Thread Charities has provided therapy equipment like therapy balls, headphones for music therapy, mats and a variety of fun toys for each center. We toured each of the facilities and it sure looks like a big hit with all of the proud families! It was really fun to interact with the kids! Well, yesterday was an amazing experience for our school age kids, Quin, Samantha, Eloise, Paige and Jack. They got to make homemade dumplings with kids who live at the orphanage. Seriously! This was as cute as it gets! It amazes me that some of these children from the orphanage still are not matched. They are typical kids with a variety of special needs. But today they got to work as a team to chop vegetables, mix up the pork, roll out dough, use chopsticks to add the filling and make pretty symmetrical little dumplings! But kids will be kids and a it did not end without digressing into a fun and naughty food fight. Everyone had a blast! A foster mother told us that her child doesn’t talk much at all., nor does he interact with others and prefers to be by himself with a single toy. Anne asked if he ever asks for something he wants such as food. Foster mom said, “No. He just brings my hand to the object he wants.” Children with autism have difficulty interacting socially and prefer to focus their attention on an object rather than a person. Often they lack verbal abilities. If a child with autism, for instance, wants a sucker unwrapped, he will place the sucker in the caregiver’s hand and stare at the hand rather than interact face to face. The goal is to increase social skills by enticing the child to ask for what he wants by looking into the caregiver’s eyes and even asking for the object by name. Anne enticed the child with a particularly visually interesting toy. The child became fascinated with it but as soon as he put it down, Anne scooped up the toy! When the child went to look for it, she brought it up to her face with animated gestures and a huge smile. As soon as he made eye contact, (success!) she handed the toy to him as a reward. The next step was to up the ante. This time when he put the toy down Anne picked it up again. When the little guy looked for it a moment later Anne did the same gesture by bringing it up to her face… this time saying the Mandarin word for toy: “Wan ju!” Our little guy really wanted that toy. But Anne kept bringing it to her face saying “Wan ju!” Finally after several rounds of this the child reached for the toy, made eye contact with Anne and said, “Wan ju.” Huge success!!! The foster mother was amazed, but better yet, she now had a therapeutic intervention to help her child with autism. 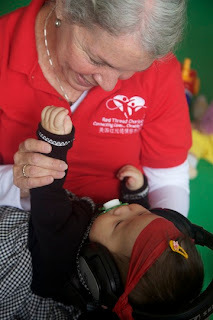 Our volunteer group has now arrived in Shanghai! Some have been doing a little touring in Chengdu to see the Giant Pandas and some have just arrived. We will be seeing the sights in downtown Shanghai today in order to acclimate to the time change. We're planning on the Shanghai Museum, the Bund and a little light shopping...and of course you can't go to Shanghai without eating dumplings. 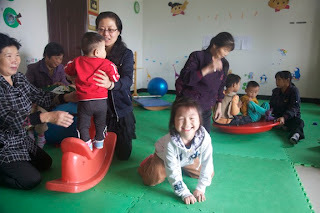 Sunday afternoon we will head over to Hangzhou by bus and then it is a week of seeing the children and working with the staff. We can't wait to see everyone! We are bringing 8 boxes of donations...pediatric walkers, bath chairs and positioning and seating devices!!! 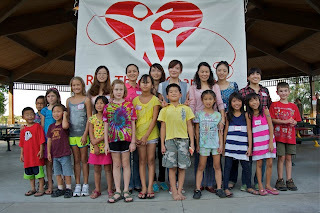 Thank you to all the friends of Red Thread Charities who donated to this cause! 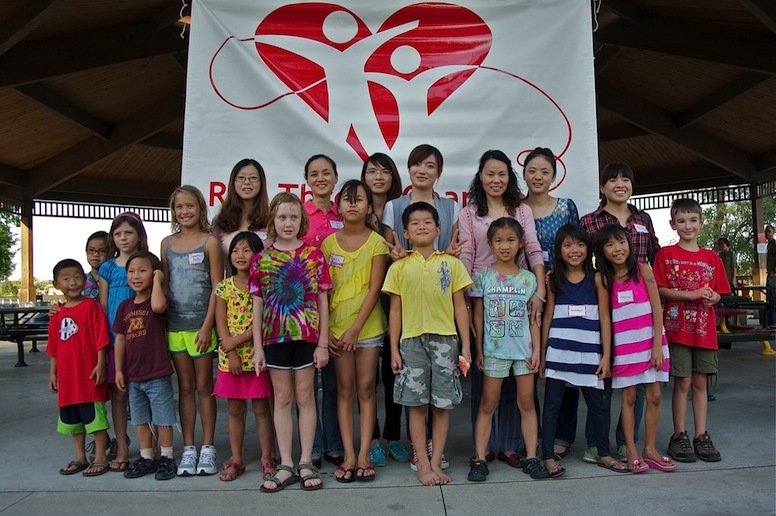 Red Thread Charities hosted a potluck picnic at a park in Mpls while our friends from China were here. Volunteers from previous trips and new volunteers for this October's trip were here to meet and greet the ladies. A very special surprise were the attendance of some children who had at one time lived in the care of these ladies, walking in and being immediately recognized by their former nannies. It made more than one of us shed a tear. * Children learn through play. * Inclusion and mainstreaming children is best for everyone. These are concepts that are new to China and by the end of the trip our friends really understood why we in the US incorporate these ideas into our education system. Question: "Doesn't it make the child with a special need feel bad being included with typical children?" Answer: "I think you're mainstreaming in the orphanage without realizing it. How do the children with no obvious special need, such as a repaired heart react to the child who who has a more visually obvious special need such as a missing limb?" 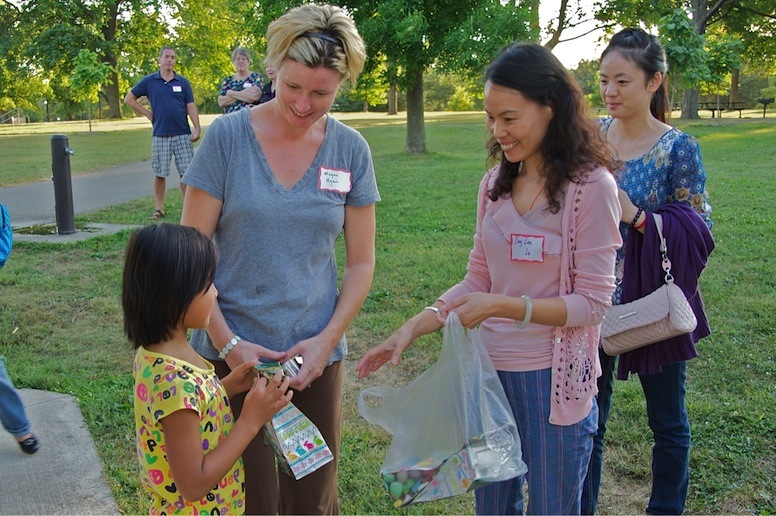 The staff acknowledged that, "The children accept them very well." You see we are the same all over the world, and education is the key to helping adults realize what children instinctively know. Here is a photo of the ladies playing in the lycra climbing gym at Point of Stillness Therapy Center in Hudson WI.